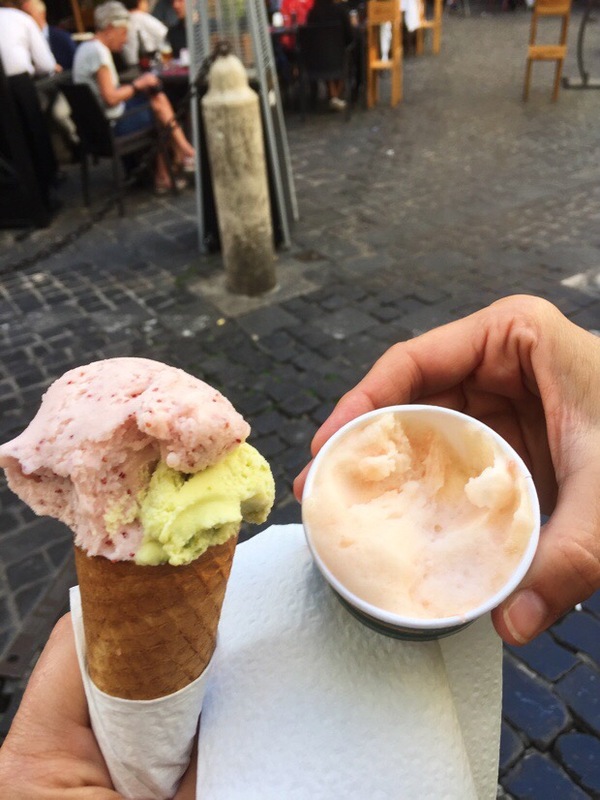 OH MY GOSH I’M IN ROME AND THERE ARE A MILLION PEOPLE EVERYWHERE AND I WANT TO GO BACK TO TUSCANY BUT ACTUALLY IT’S REALLY BEAUTIFUL HERE BUT I’M EXPERIENCING SENSORY OVERLOAD SO…GELATO IS THE ANSWER FOR EVERYTHING! 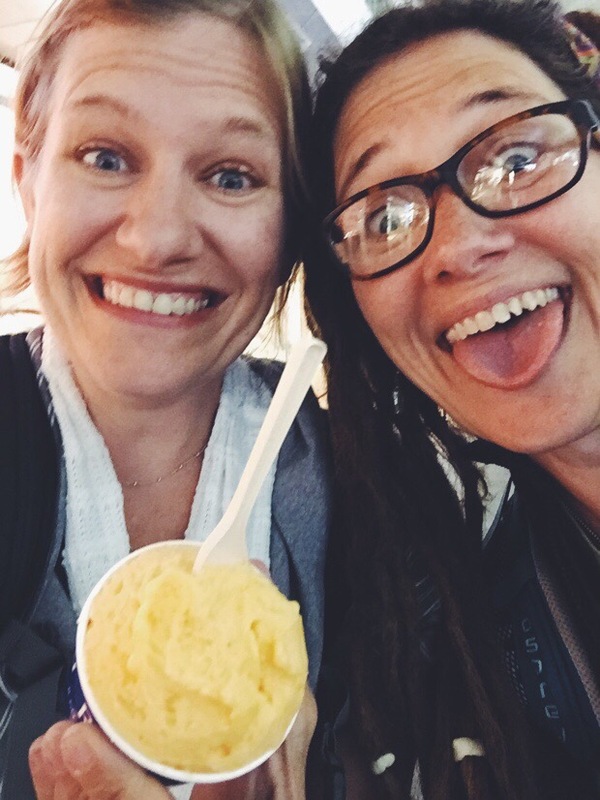 I am not exaggerating when I say that my sister and I had gelato a MINIMUM of three times a day while in Rome. And one day we had it four times. Because it was a really hard day and we needed extra. I know it sounds crazy to say it was a “really hard day” while on a trip to Italy, but this, my friends, is the reality of travel sometimes. Sometimes (all the time? ), the Instagrams don’t tell the whole story. Travel is messy. Plans have to change constantly. Rain pours down in buckets while you are walking to the Vatican. 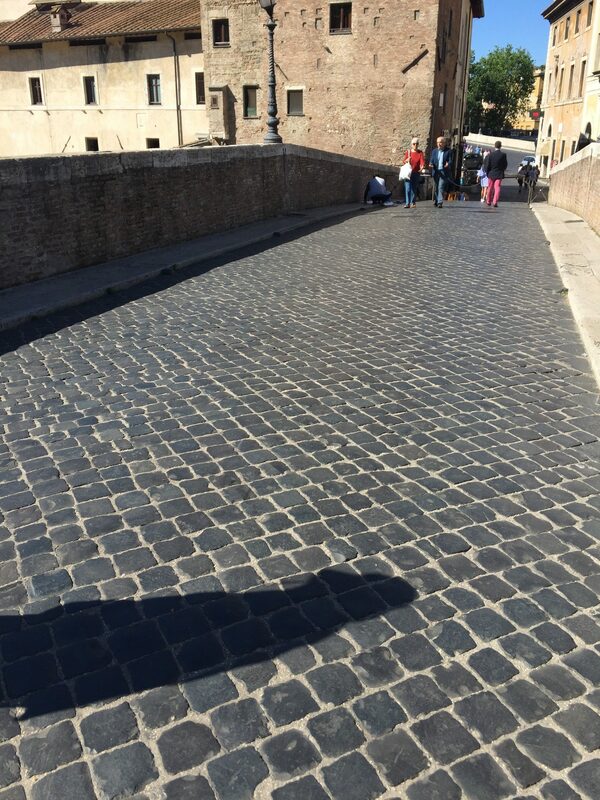 Strollers run over your toes on your way into the Sistine Chapel. Throngs of people press in with you to see Michaelangelo’s Pieta in St Peter’s Cathedral. 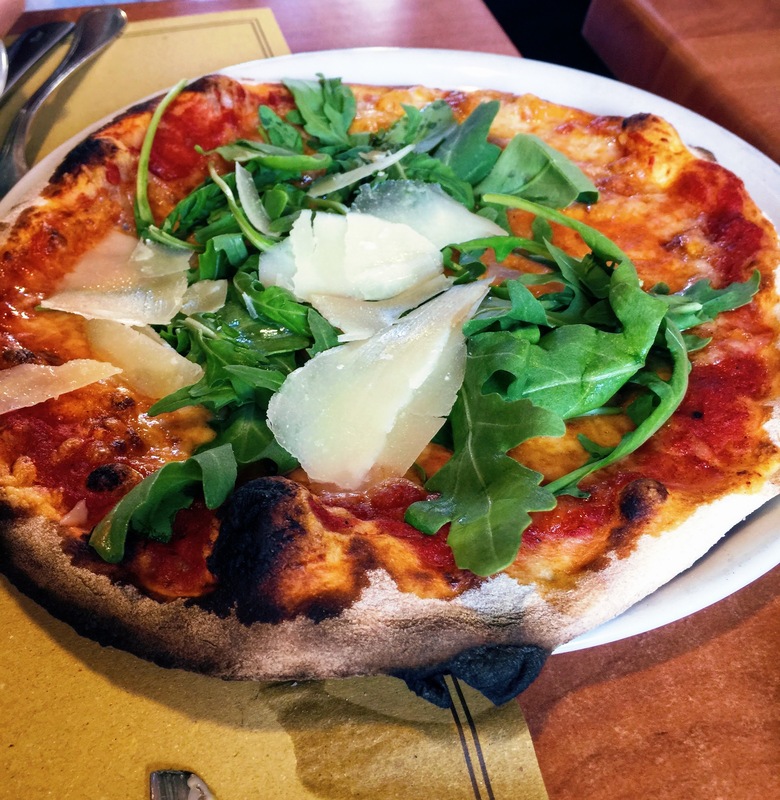 The pizza you grab on the way to your next tour is not the pizza you had dreamed of when you imagined yourself in Rome. But, maybe the beauty of travel (and of life) is found in the surprising notion that the messy places is where the magic happens. 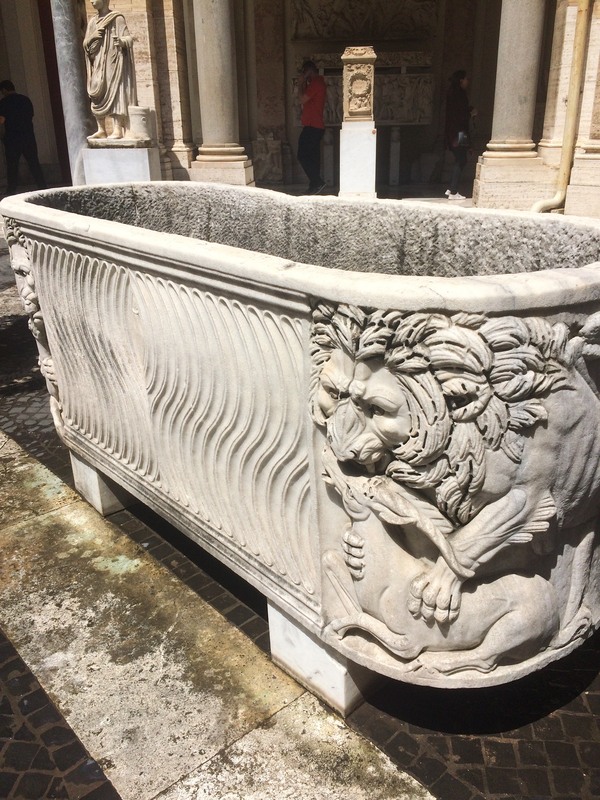 I was perhaps staring at this sarcophagus (with eleventy million other visitors) when I first began to feel that coming to Rome was not the best plan ever. Which was fine. Except for the fact that I still had four more days in the city. Crazy me. 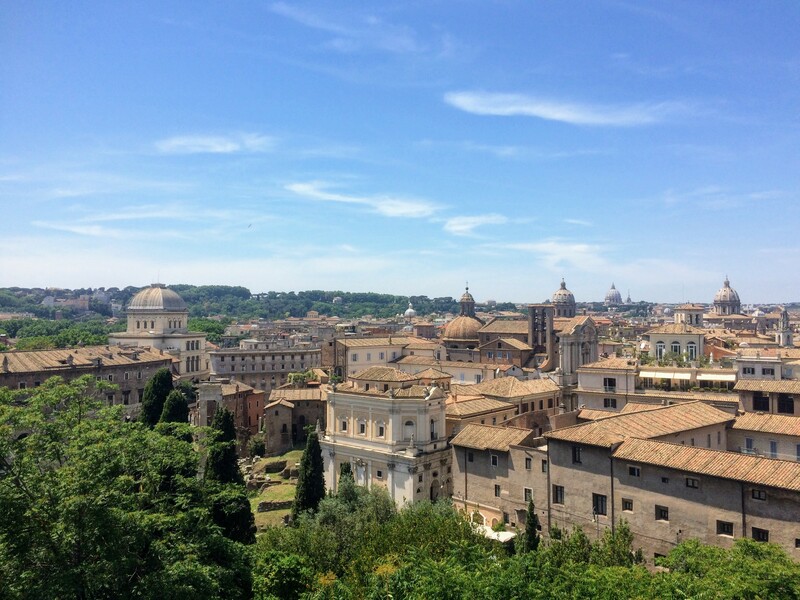 I had thought…if I’m going to Rome, I want time to explore! So I began to spin. Ugh, I should never have booked that tour through the Vatican. It made the day too stressful. And now we have a tour tomorrow too. It’s too much! Why did I think I needed four nights and five days in Rome? I already know I love smaller towns over big cities! What’s wrong with me? I am so stupid! I never plan anything well. Ok, well at least I’m staying right by the train station. After you leave, I can just take day trips to places outside of Rome for the rest of my trip. I don’t have to spend any more time in this crazy city. 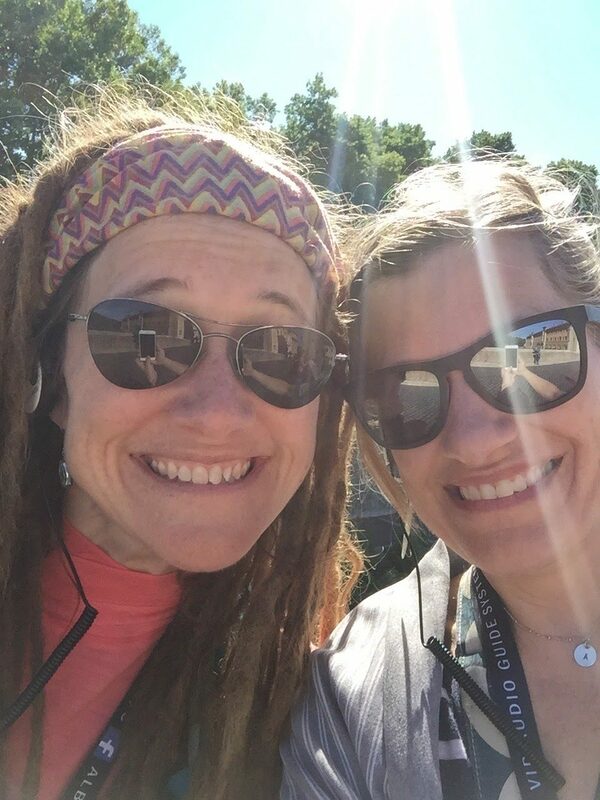 Over the last year, Anna has been meeting with other people who spend their lives leading other people. (I’ve mentioned it before, but my sister is a superwoman business owner and she manages to run her restaurant, be a wife and mama, exercise and look gorgeous all at the same time.) One of the products of Anna’s time in this leadership group is that she manages stressful situations by stopping and asking lots of questions. One of the questions Anna loves to ask is: Is that really true? Is it really true that you don’t plan well? Is it really true that we should have stayed in Tuscany? Is it really true that you’re done with Rome? Honestly, it can be kind of annoying. 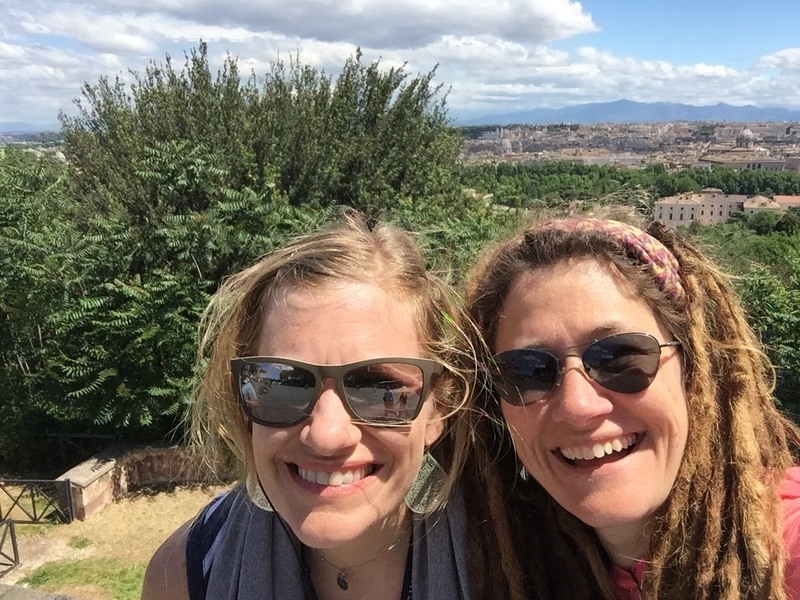 So instead of going to bed on our first night in Rome wishing we had never left the glorious sunshine and vineyards of Tuscany, we processed our disappointment with Anna’s guru-type questions and resolved to leave our flat again the next day with open hearts towards Rome. The skies were blue the next morning as we walked to the meeting point for our tour. The streets were almost empty compared to when we were walking them the day before, and I remembered how much I love to wander around a city in the morning, when everyone else is asleep. 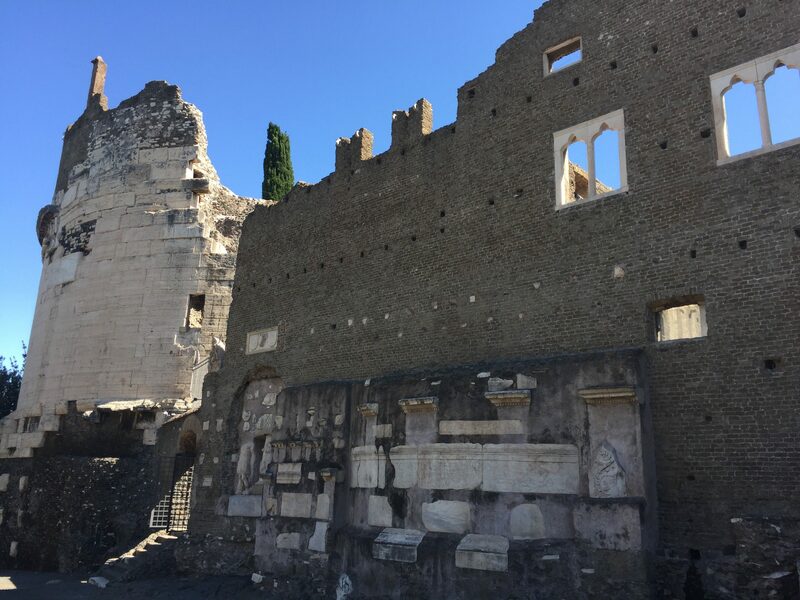 We meandered along the Forum and wondered at places so ancient. Around 9:30 we reached the Teatro di Marcello, which is where our tour would begin. 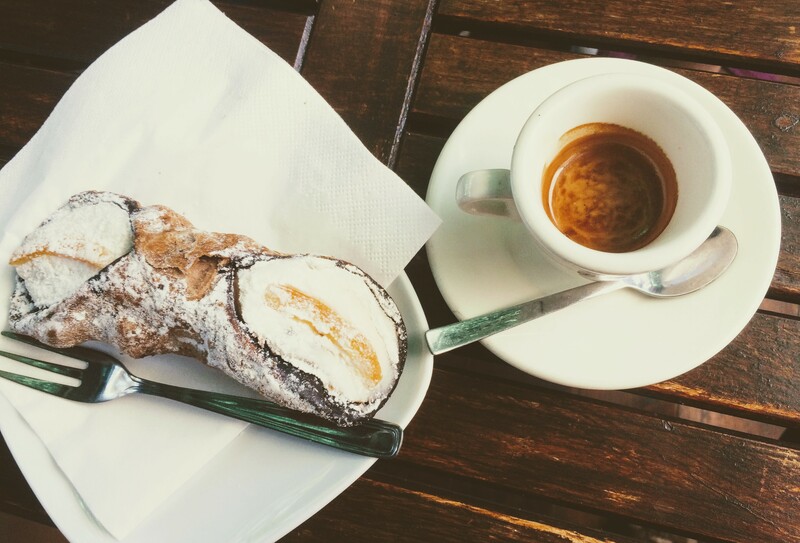 We sat down and grabbed a coffee and pastries and sat in the sun while we waited to meet our guide. Already day 2 in Rome was outshining day 1. 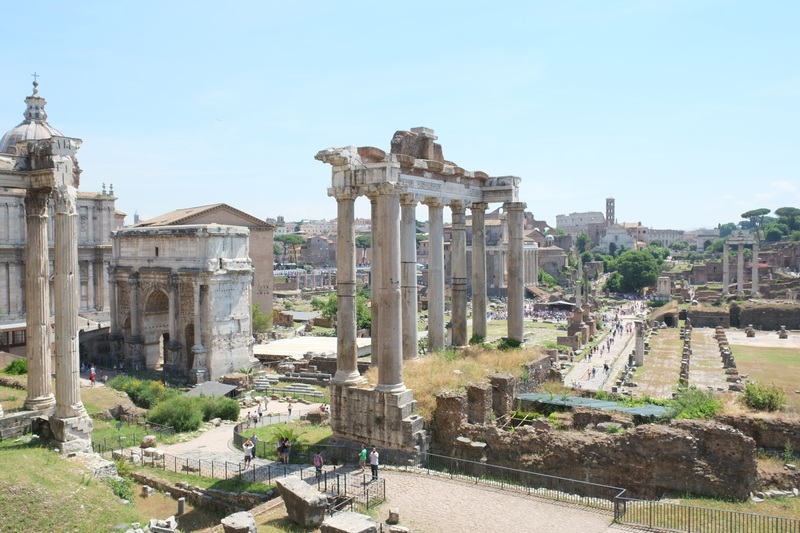 The tour we had booked is called Rome: Hidden Gems and Ancient Wonders with Walks of Italy. 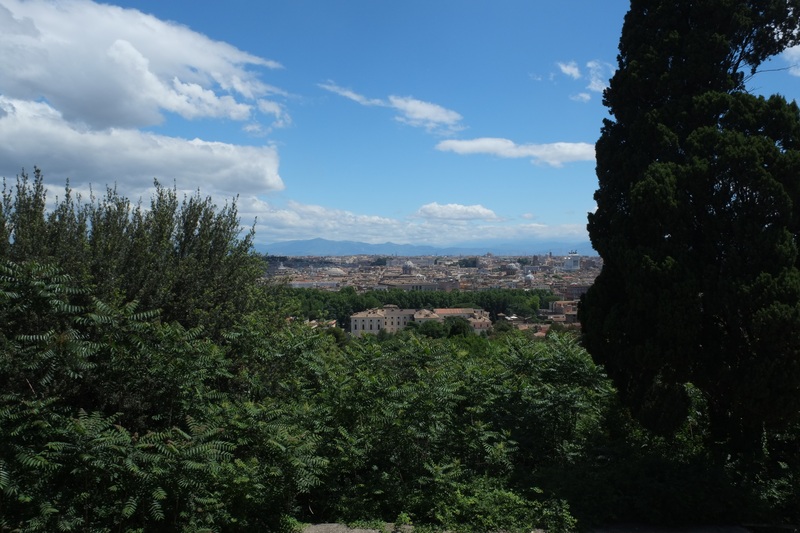 We were going off the beaten path to see lesser known sites in and around Rome. The max size of the tour was 15 people, and we were even going to do a bit of touring via bus. 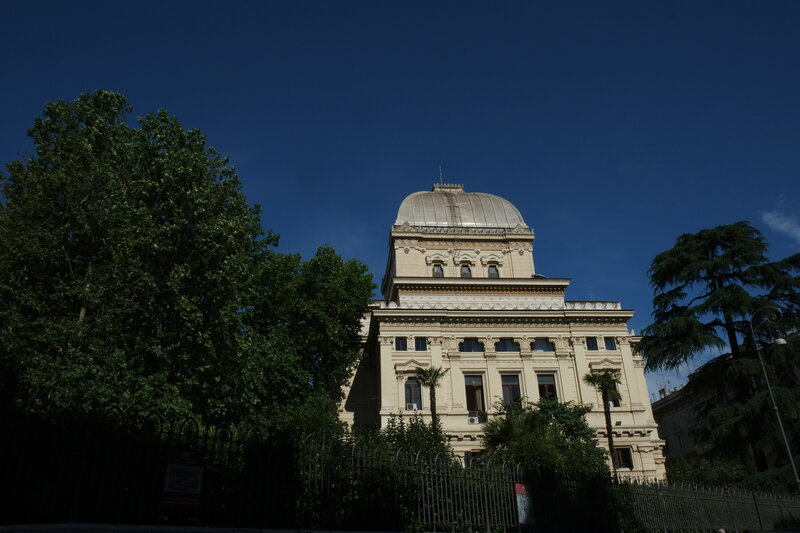 Like I said, we started out in front of the Marcello Theater, a 3000 year old open air theater, which now houses three luxury apartments on the top floor. 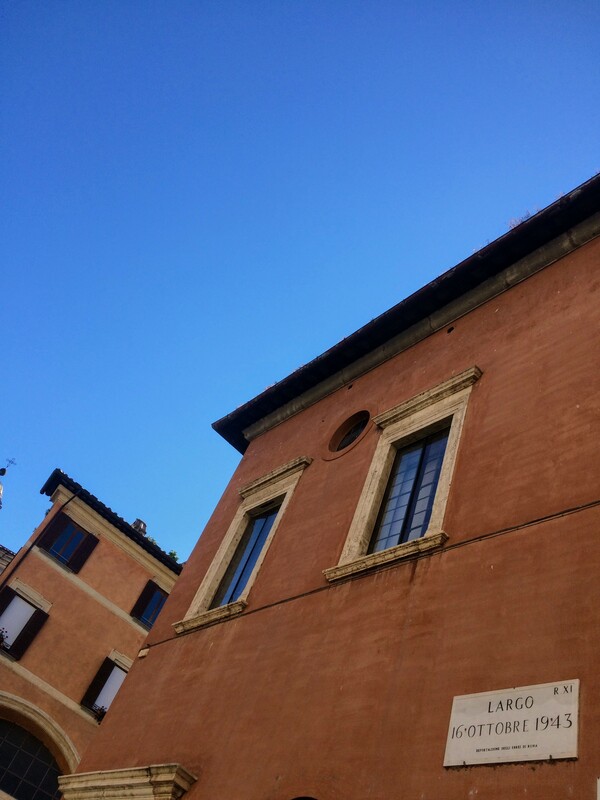 We were right on the edge of the Jewish Ghetto, and we were not steps inside of it before our guide began to point out the now familiar solperstine. 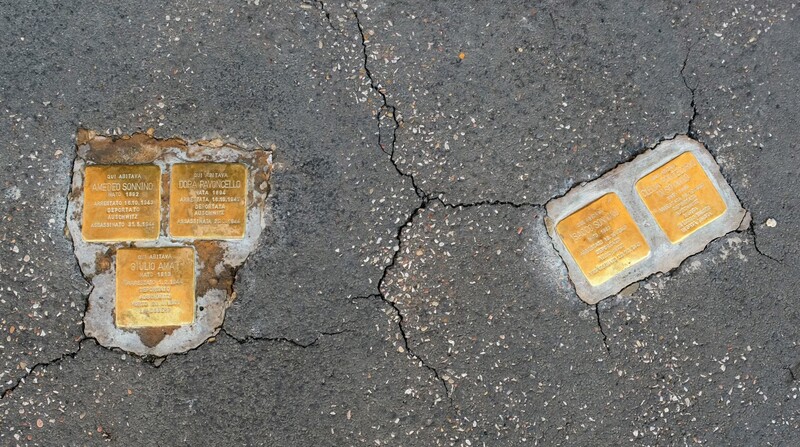 Solperstine are stumbling stones placed in front of houses where Jewish people (and other victims of the Nazi regime) last lived. If you stumble upon them, you can stop and read a piece of the tragic story of someone’s life: their name, when they were born, when they were deported and what became of them. 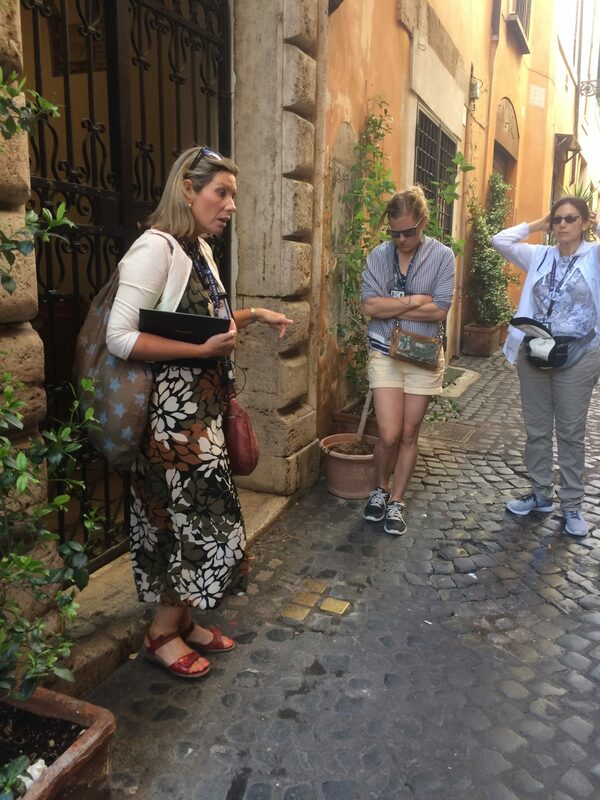 Our guide, who was super lovely, told us the history of the Jewish Ghetto, where all Jews were made to live in Rome and how during WWII the German government told them if they came up with a huge amount of money (I think it was 50kg of gold), they would be allowed to remain in Rome. The community paid the money. And of course the Nazis did not keep their word. 2000 Jews were rounded up and deported (many to Auschwitz). Our guide pointed out a small placard on a building noting the date of the deportations. Later I walked by what is perhaps the largest collection of solperstine I’ve ever seen together. 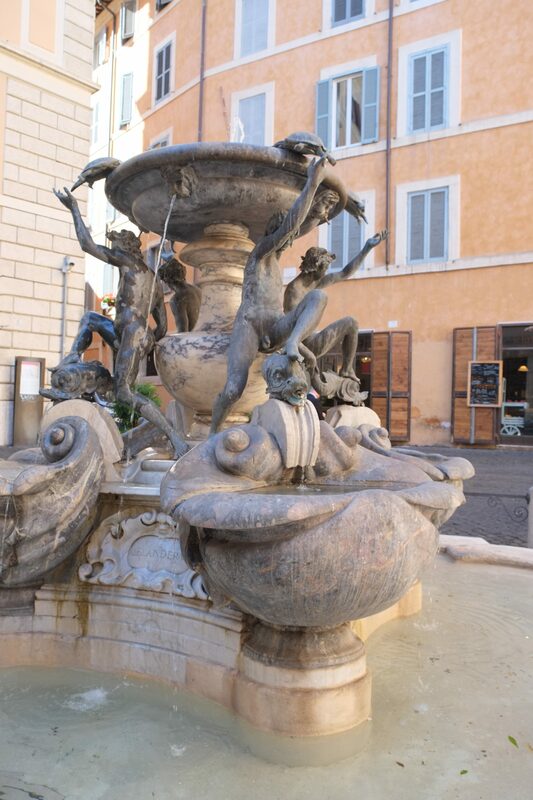 These days the Jewish Ghetto in Rome has been restored to be one of the most beautiful neighborhoods in the city. 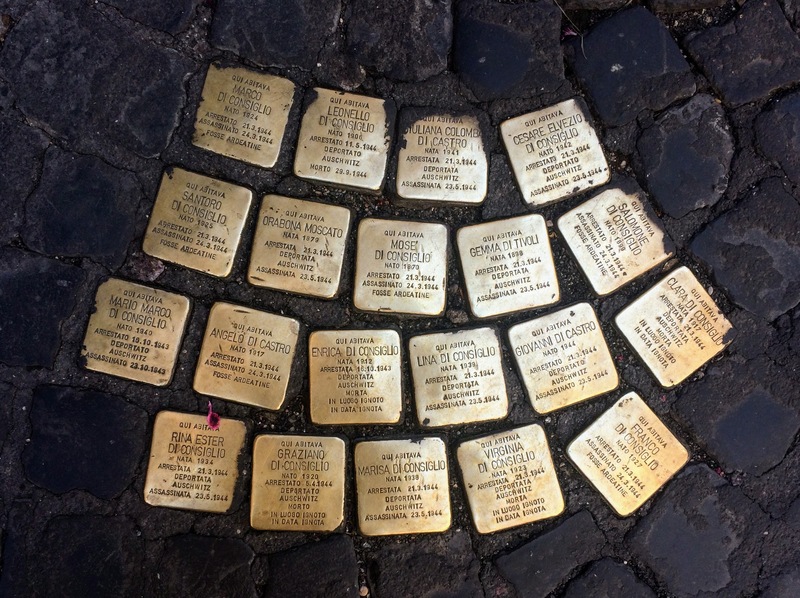 And for perhaps the first time in Rome’s long history, Jewish Culture is celebrated. 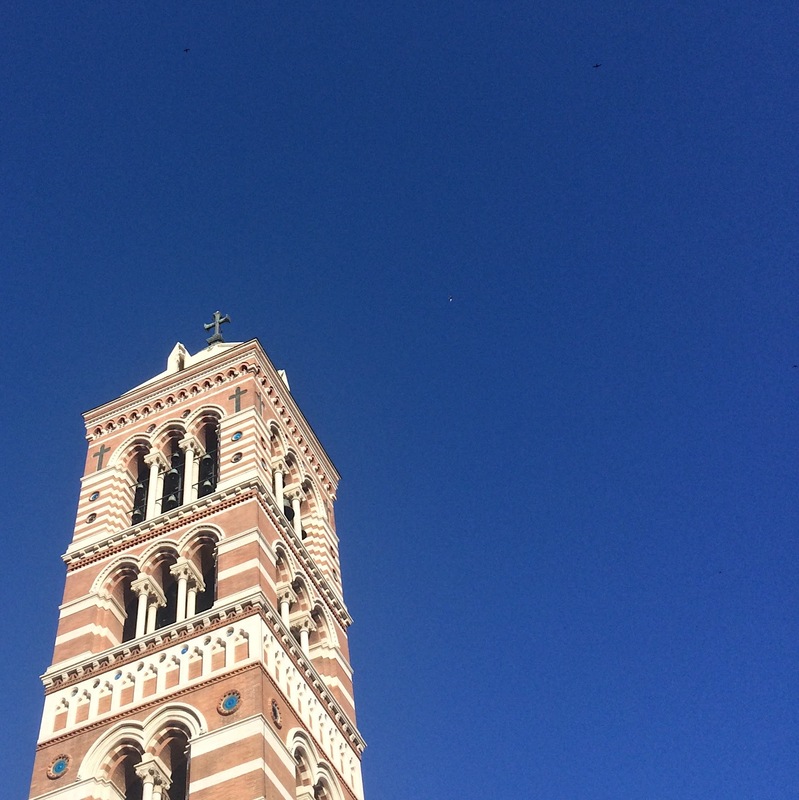 The Synogogue’s square top stands out among Rome’s many dome-topped cathedrals. 62 BC y’all. That’s dang old. After we crossed over Tiber Island, our fancy bus picked us up and whipped us out to an even older road. 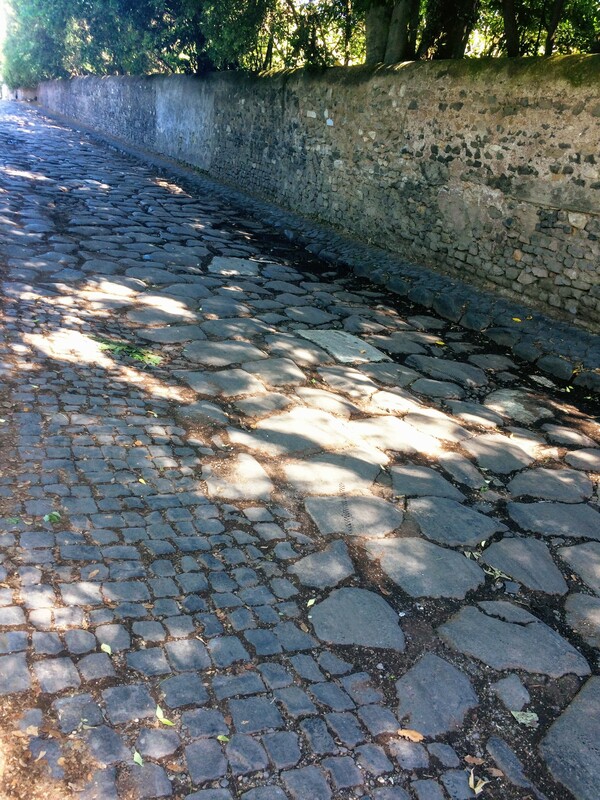 The road that led to the city from the sea, the Appian Way. This road was built in 312 B.C. and you can walk it or bike it but you are NOT supposed to drive on it. I WISH you could have seen our guide taking the driver of a wayward vehicle to task for trying to drive across these ancient stones! She also pointed out the well worn ridge marks from chariots. 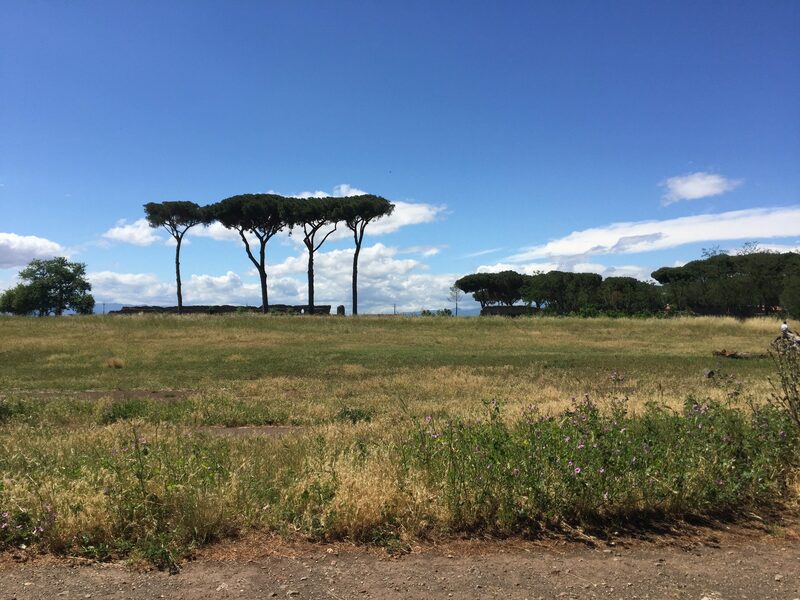 Many hecka old places along the Appian Way! Our reward for walking along the Appian Way was a stop at this LOVELY cafe. I believe it was while I was sitting in this outdoor cafe that I began to think that maybe I was not so done with Rome. Yes please, espesso and canolli! All tours should build in such lovely stops. 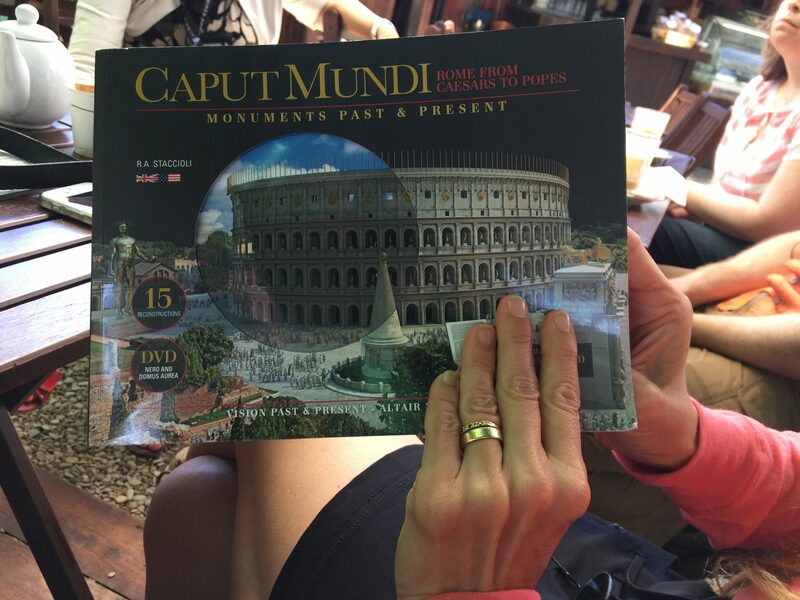 While we drank our coffee, we took turns looking at this super fun book with layered pages where you can see what things in Rome look like today and how they used to look. We also had a chance to ask questions and hear a little bit more about Rome. 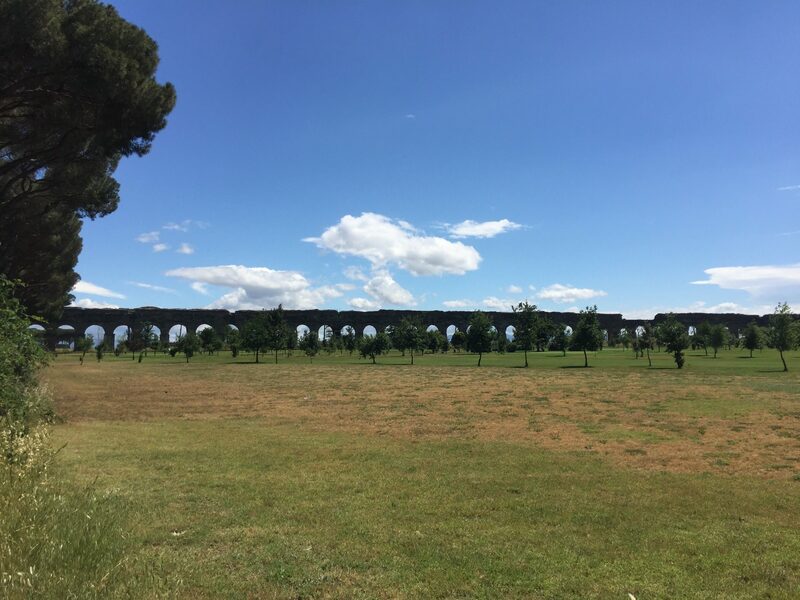 Refreshed from our stop, we were whisked away next to see the ancient viaducts. 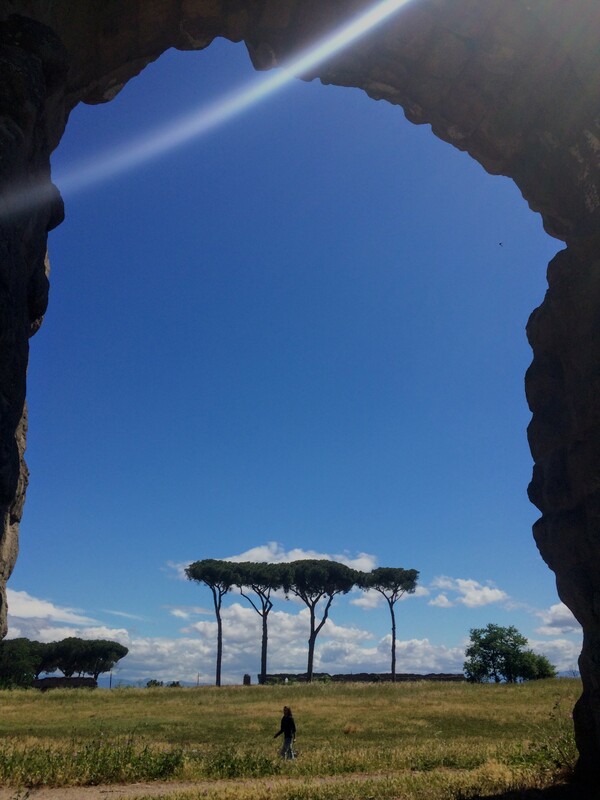 These fun umbrella trees (imported from Africa, I believe) are all over Rome. I loved these trees. Also near the viaduct was a golf course and a running/walking trail. 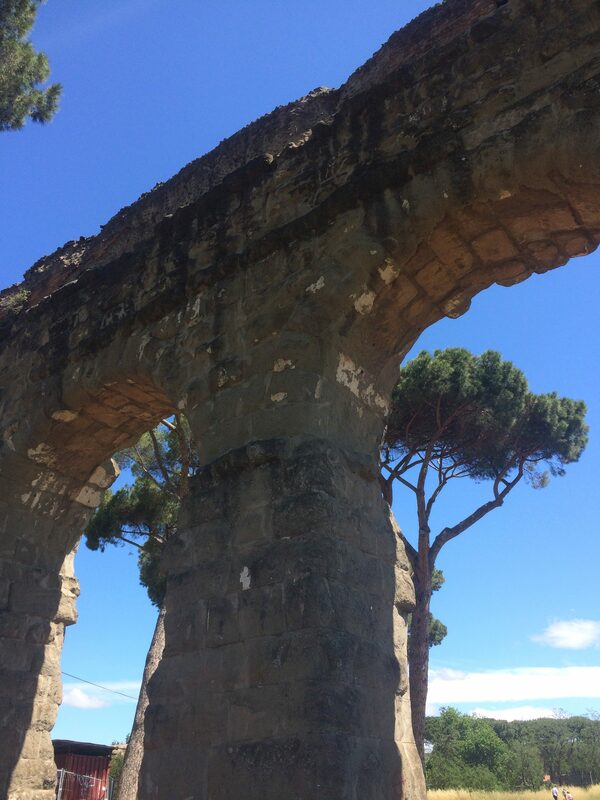 It’s super amazing to me that if you live in Rome, you go walking or running or golfing along structures that are so old. Ancient Romans were super clever y’all. 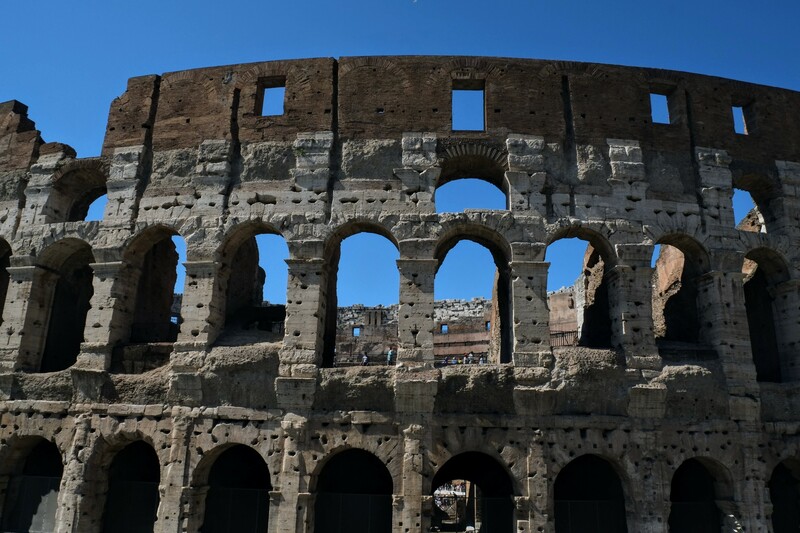 Clean water coming into the city was key to the health and success of the Romans. One of the ancient viaducts still dumps into the city at the Trevi Fountain. I had been to the fountain before but had not realized it was built to celebrate this long-running source of water. After the viaduct tour, we rode our bus to a spot where we had a gorgeous view of the city. This was the end of our tour of lesser known sites of Rome with Walks of Italy. 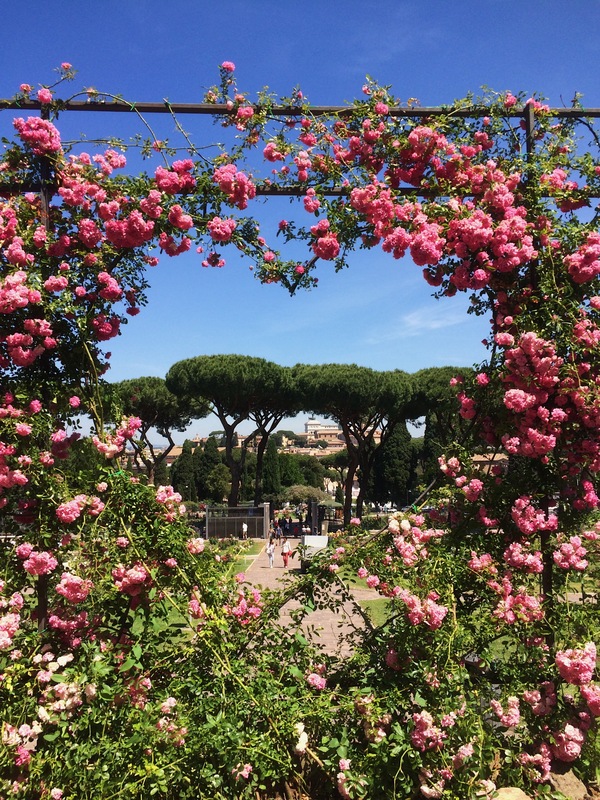 Anna and I both said all day long how much we preferred it over touring the Vatican, but interestingly, I noticed during the rest of my time in Rome how things I had learned at the Vatican kept coming back to me. 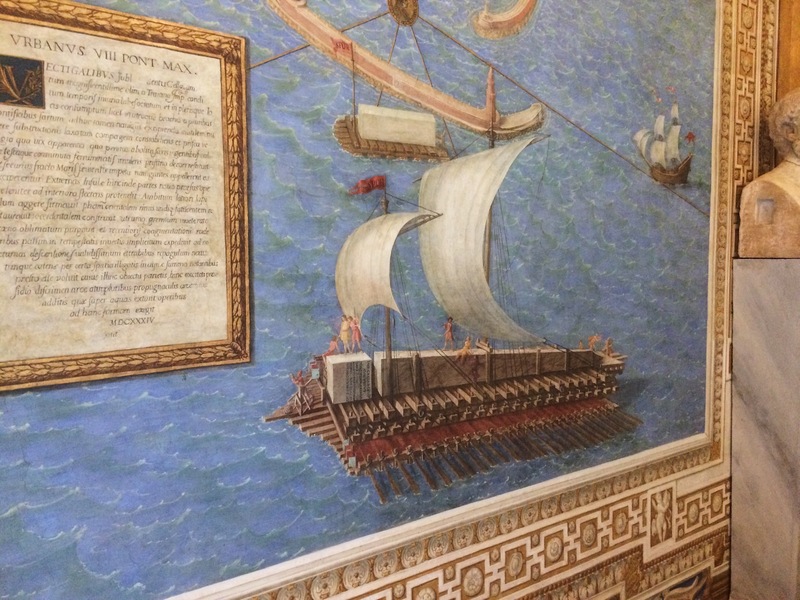 For example, we learned that the exquisite tiled floors in the Vatican were actually ancient Roman floors that had been moved to the Vatican museum during the Renaissance. 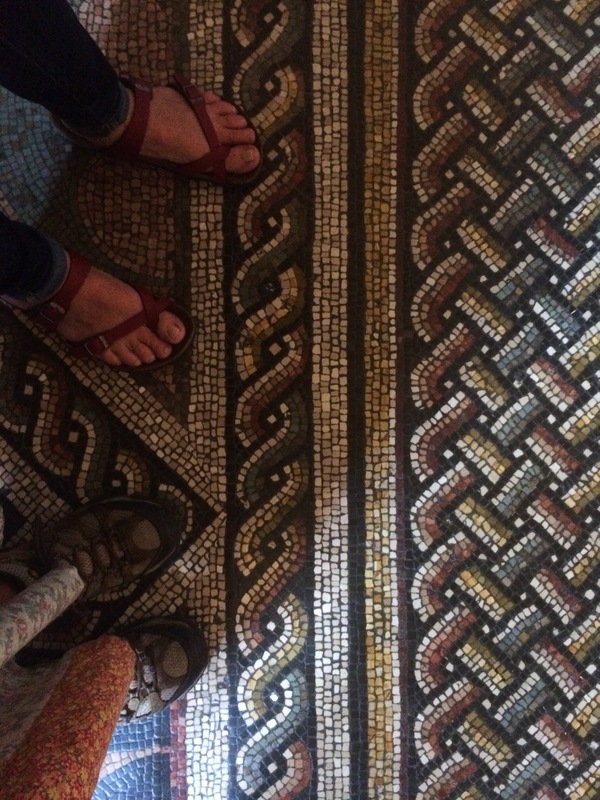 So later, I was in a coffee shop and I saw a floor similar to one I had stood on in the Vatican Museum and I realized I was standing on an Ancient Roman floor, even though it was just a simple coffee shop. Floors like these lined the Forum at one time, but the popes took all the more valuable colored stones and marble from the Forum and re-used them in Vatican City to make it the rather grand place it is today. So before I was through with Rome, I was grateful that I had toured the Vatican. I just didn’t enjoy it in the midst of it like I thought I would. 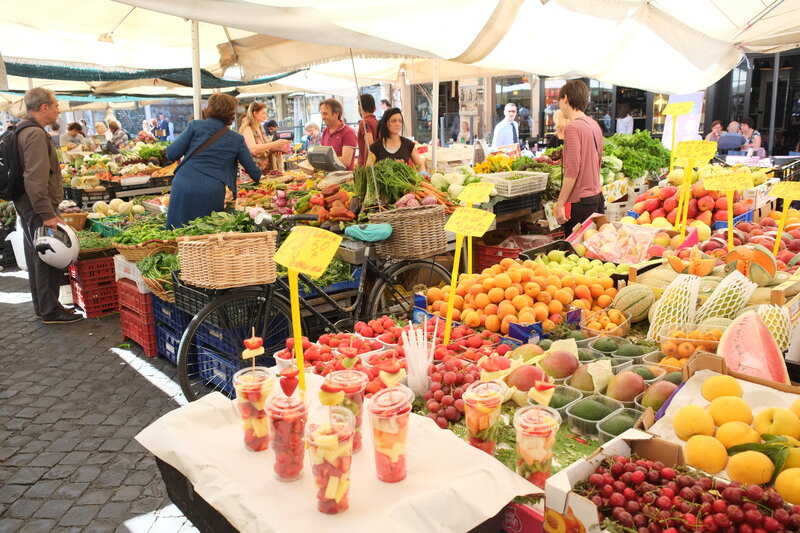 However, Anna and I both loved our second tour of Rome most of all, and BONUS: our guide gave us all some lunch recommendations near where our bus dropped us in the city. Anna and I enjoyed maybe our best meal in Rome at the little tucked away restaurant she recommended, Il Bacaro. After lunch, Rome had definitely heated up and grown super crowded again, but it was Anna’s last day, so we pushed through to the Trevi Fountain, the Pantheon and the Colosseum. We saw all of these from the outside while shooing away street vendors. And in between walking to each of them, we made more stops for gelato. For dinner we headed to the darling Memento Mori neighborhood and had pizza and again, gelato. Both were divine. We loved the super original flavors at Fatamorgana. This turned out to be probably my favorite gelato stop in Rome, and the only one I repeat visited. 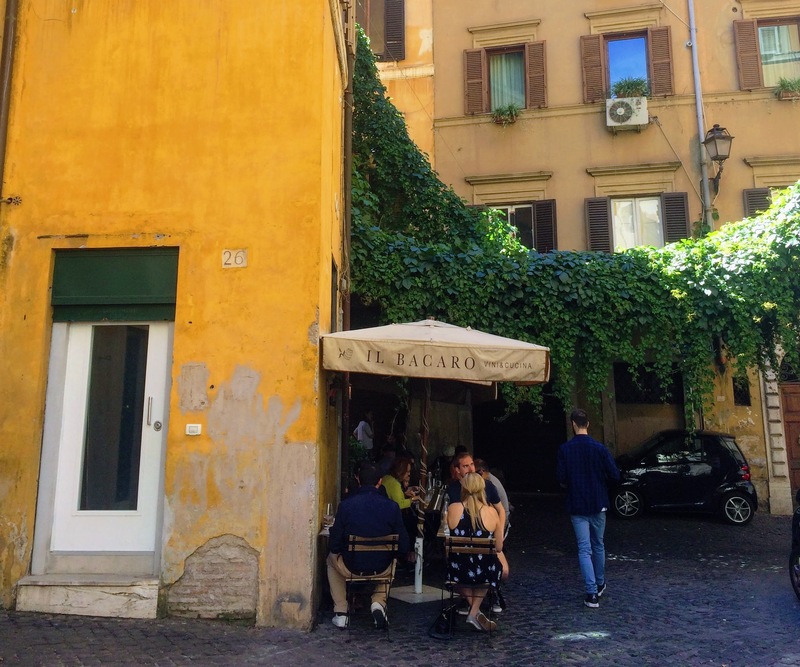 Since I was spending day 3 by myself, I researched quiet spots in Rome and made a map and a walking tour of places I could go and not be harassed by street vendors. I got a super early start since I walked with Anna to the train station before her flight. 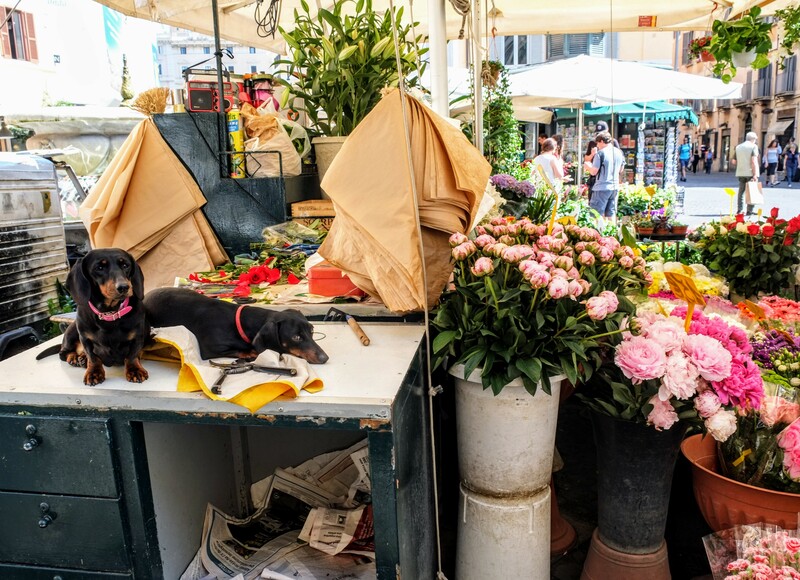 I had a quiet breakfast and coffee, before walking to Campo di Fiori, a sweet square full of market stalls. 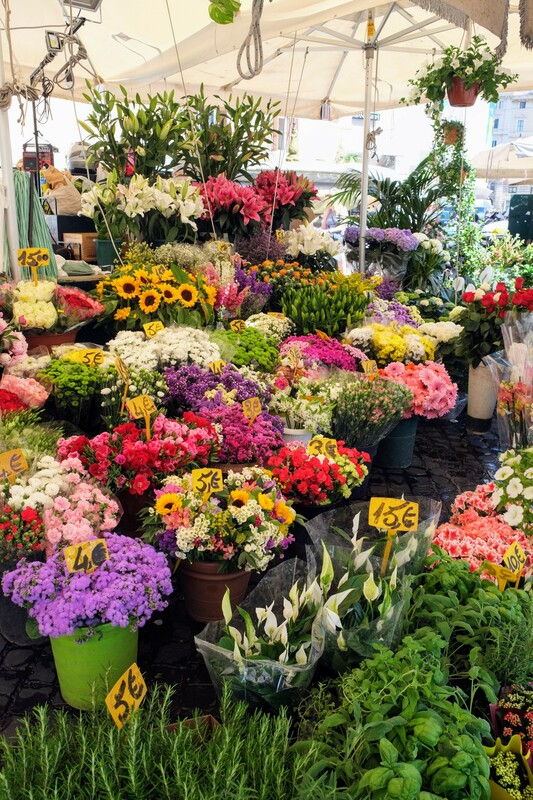 I wandered around watching folks get set up for the day, looking at flowers, fruit, pasta and all kinds of other colorful displays. From the Campo di Fiori, I went to Palazzo Spada, where I had several rooms full of art entirely to myself. 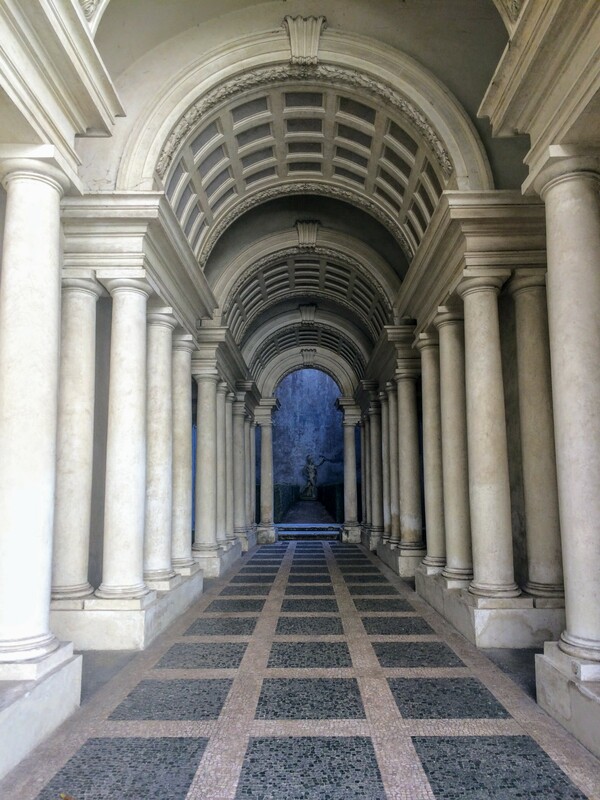 Inside the Palazzo is also Borromini’s forced perspective gallery. The hall is built to appear much larger than it is. The statue at the back is actually only three feet tall. I read that artists love to come and draw the gallery, but on the morning I visited, I sat in front of it sketching all alone, delighted to discover that quiet spots in Rome do exist. 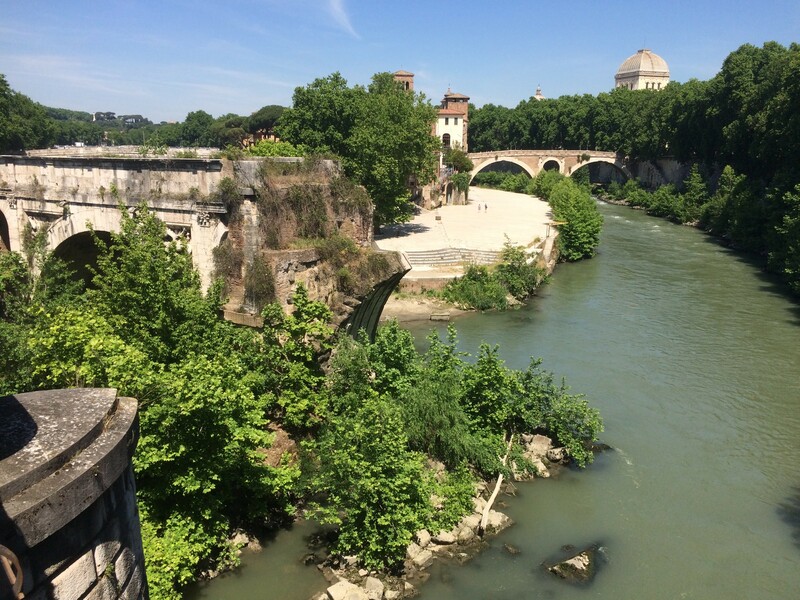 Next I headed back to the Tiber River we had crossed the day before and walked the long length of one side, crossed over a bridge and came back up the other side. Both sides are lined with great walking paths. There is a piece of an older bridge in the water that is cut off from both sides, a monument to how even the most grand structures built by man eventually crumble and fall. 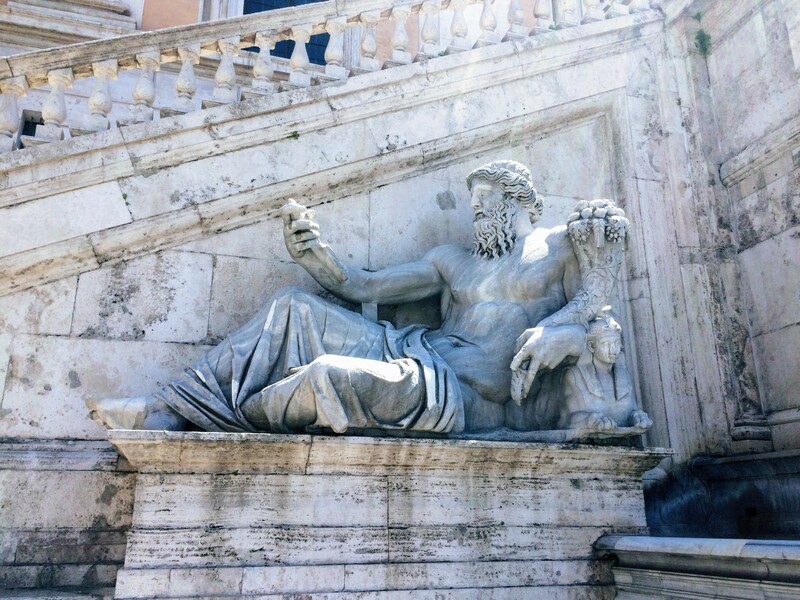 You can not walk around Rome without being struck by how empires fall. 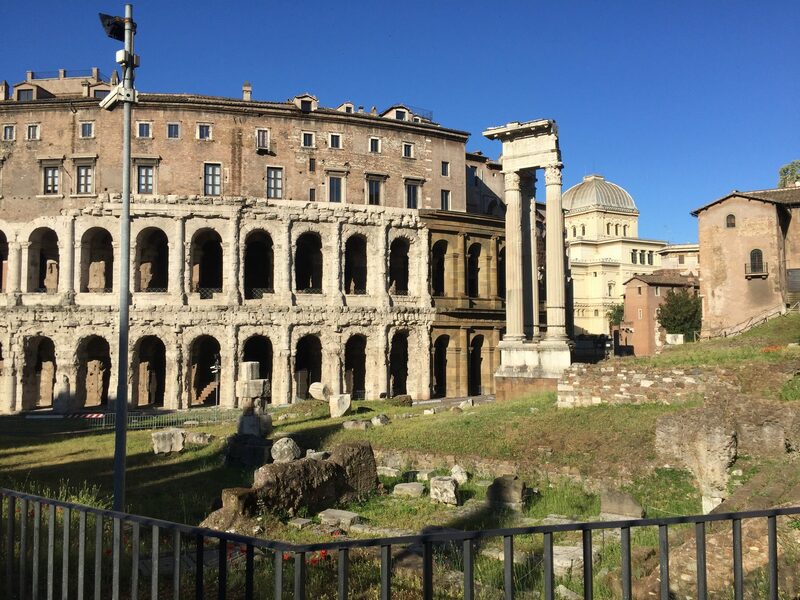 Especially when you see pictures of what these places used to look like, you begin to see that much of Rome’s glory is in the past. 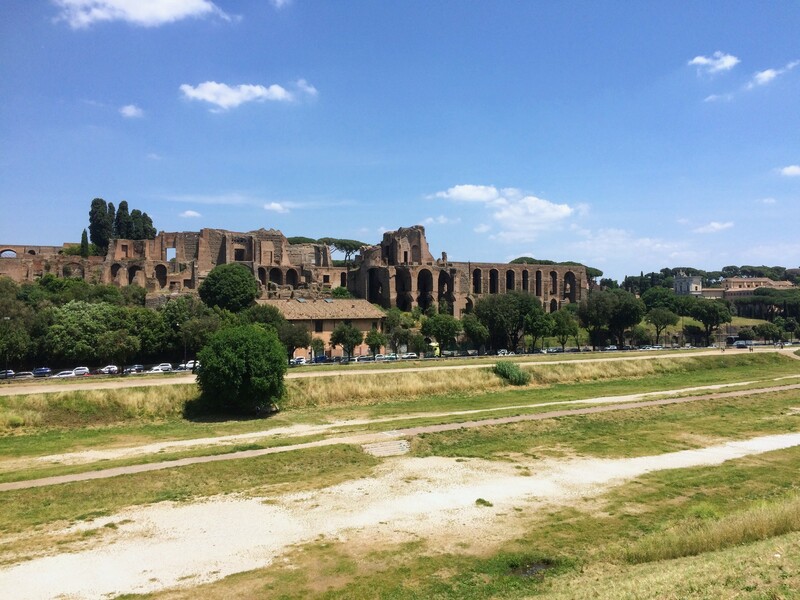 After the river, I walked over to Circus Maximus, another ancient site now used as a jogging track and a sometimes fairground. Above Circus Maxiumus is a darling rose garden with benches scattered throughout and water fountains. A refreshing pause on my walking tour. And above the rose garden is the Garden of Orange Trees. 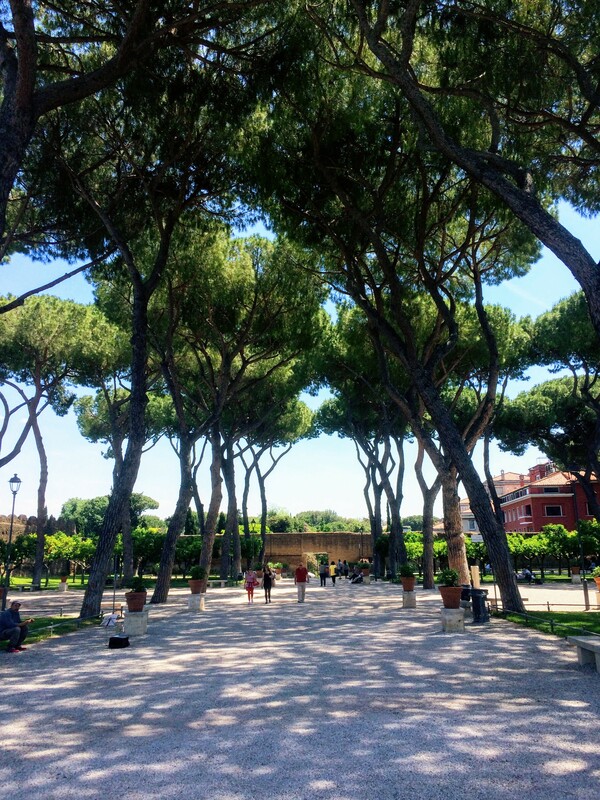 This was maybe my favorite of the quiet spots in Rome I found. 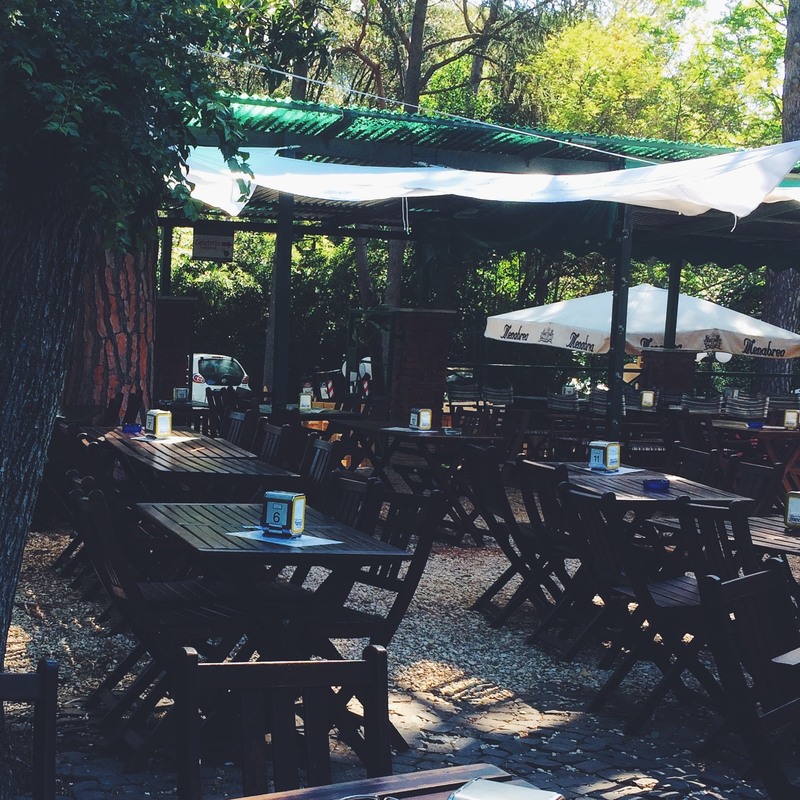 Il Giardino degli Aranci had wonderful views of the city and shady spots to sit and write. I spent a couple of hours here, sitting and writing in my journal. I then wandered back down into the crowded parts of the city and all the way back to the flat. I stopped and bought some ingredients at a grocery store to make a salad, which I enjoyed while looking out my window and listening to the street noise below. The next day I met up with a friend of mine from Tübingen who had been traveling around Italy. 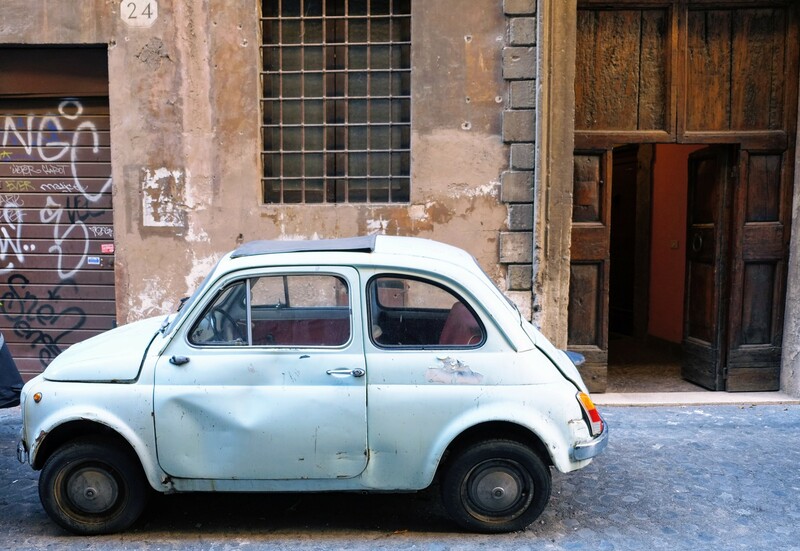 We also hit the streets of Rome early to stop at a couple of places she hadn’t seen. First, the Pantheon. Which was completely empty at 8am. Yes please. And then the Trevi Fountain, also empty in morning compared to the usual masses of folks trying to toss in their coins. 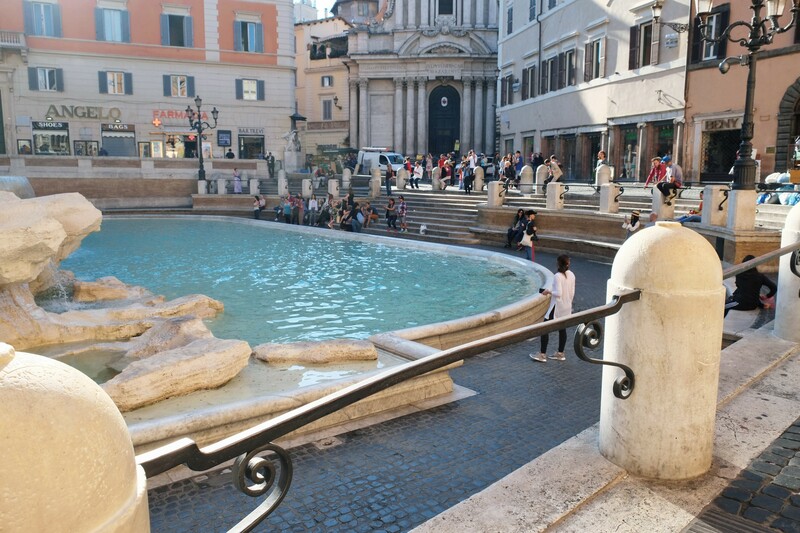 The legend is that if you toss a coin over your shoulder into the Trevi Fountain, you are sure to return to Rome. 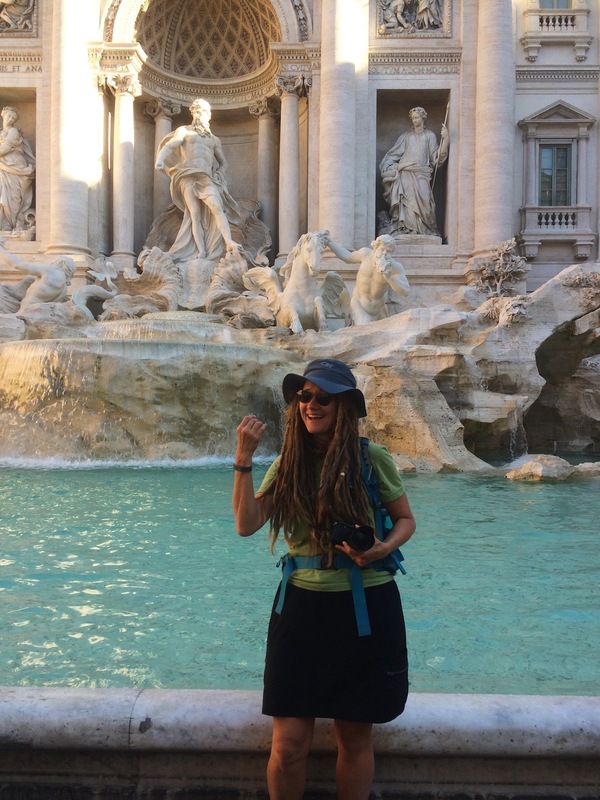 In the above photo, I am tossing in my coin not just because I want to come back to Rome but because I’m so delighted to be there without a crowd! 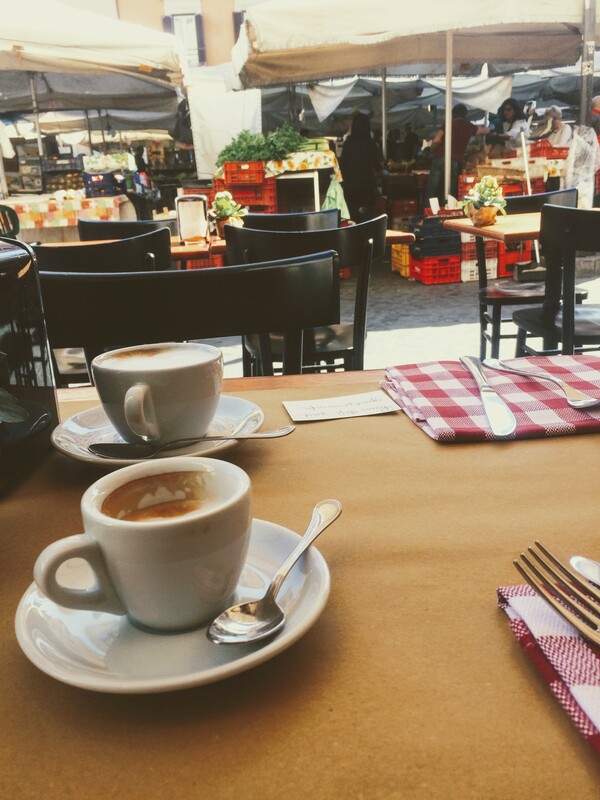 Then we went back to Campo di Fiori and sat and had coffee and breakfast for about two hours. We had both been traveling and were happy to sit in the square, talking and watching people. After our extended breakfast, we wandered around the square. The flower booth had some helpers at the flower cutting station. We wandered a few more places around Rome including the National Museum where students were outside sketching the many statues. Because we had seen all we really wanted to see, we were happy to just keep stopping for coffees and meals. She had a recommendation for a restaurant where we had a late lunch of carbonara. All in all our day was pretty relaxed and I finally felt as though I had my bearings around Rome. I still got us lost several times, but I had a vague sense of which direction to head to get where we wanted to go. The next morning we did a bit more wandering, visited two coffee shops (sitting outside for coffee is my favorite activity in any town) and headed off to catch our flight back to Tübingen. 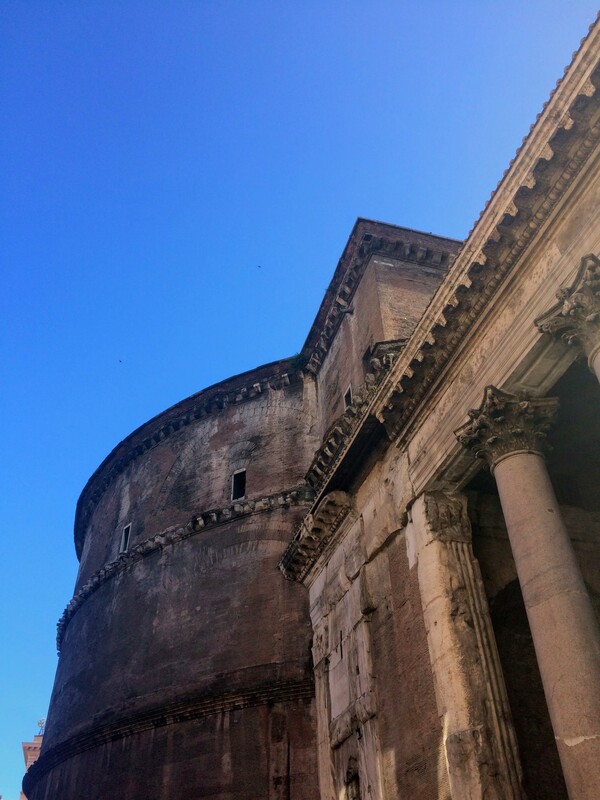 As we walked to the train station where I had been a bit despondent on my first night in the city, I felt super grateful that I had made friends with Rome. It wasn’t love at first sight, but over all I felt a fondness for the city that I had not expected. I think that Rome, like many cities, would probably be a much more delightful place to live than to visit. But of course the fact that I always find myself googling for the less-crowded places and parks makes me aware that I should probably keep walking in the countryside over taking up residence in the city. 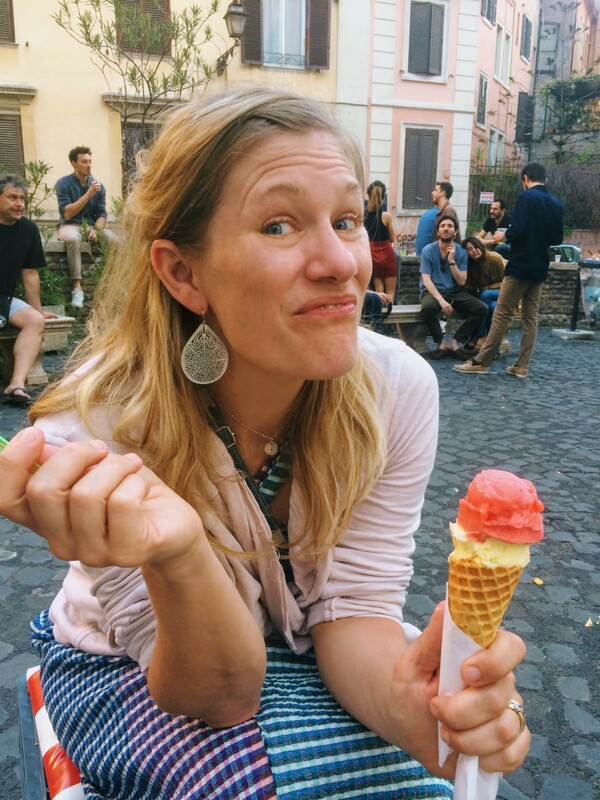 My sister and I, and my friend, collectively took three tours with Walks of Italy, while staying in Rome. 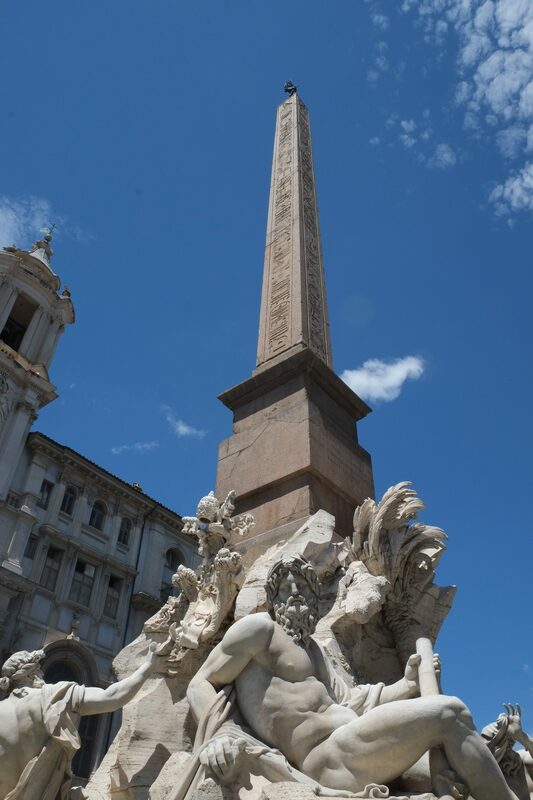 We so enjoyed our tour with Walks of Italy in Venice that I was eager to do some more, and they kindly comped our second tour (Hidden Gems and Ancient Wonders of Rome) – Thank you, Walks of Italy! 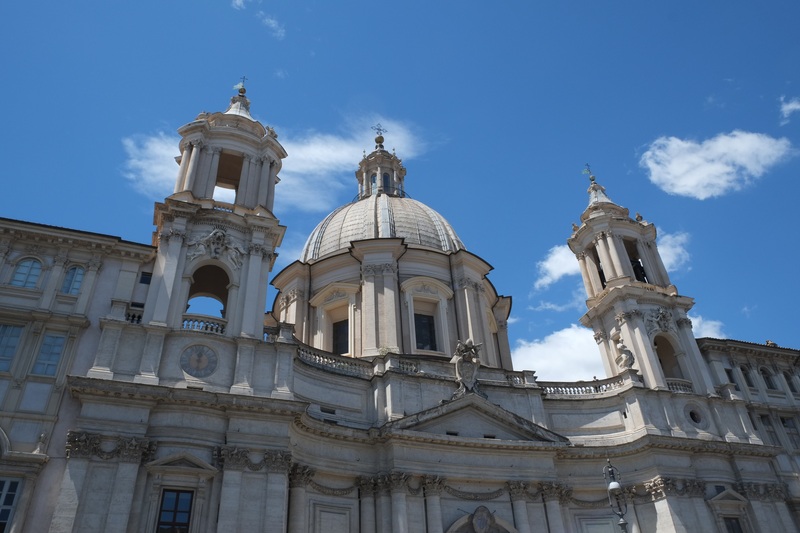 Like I said, we also toured the Vatican with Walks of Italy, but we were limited in our choice of times because my sister only had two days in Rome, one of which was a Sunday and the Vatican is closed on Sunday. 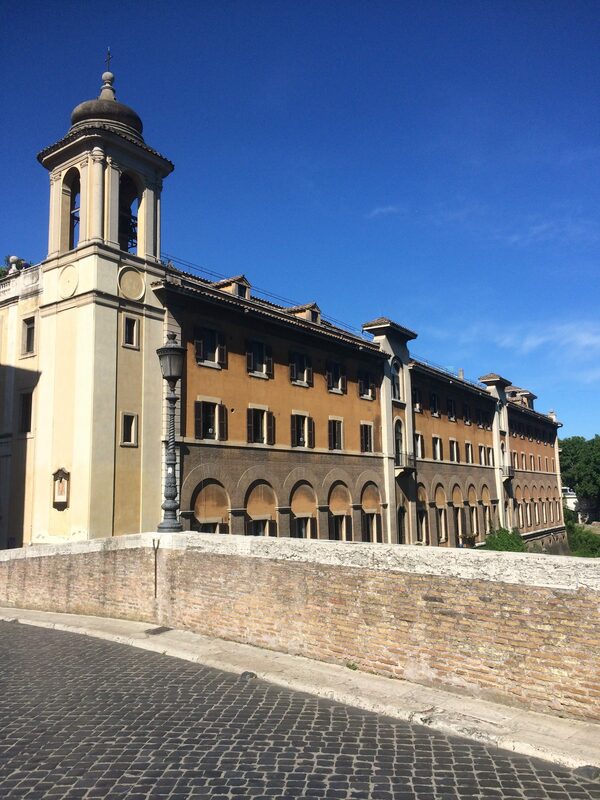 Were I to ever tour the Vatican again, I would absolutely do the early morning tour (Pristine Sistine) as opposed to the afternoon tour. And in general I find that morning tours are so much better than afternoon tours. The guides are fresh and sites are less crowded. But the Vatican Museums are impressive, and even though it was crowded, I am grateful to have seen it, especially the hall of maps. 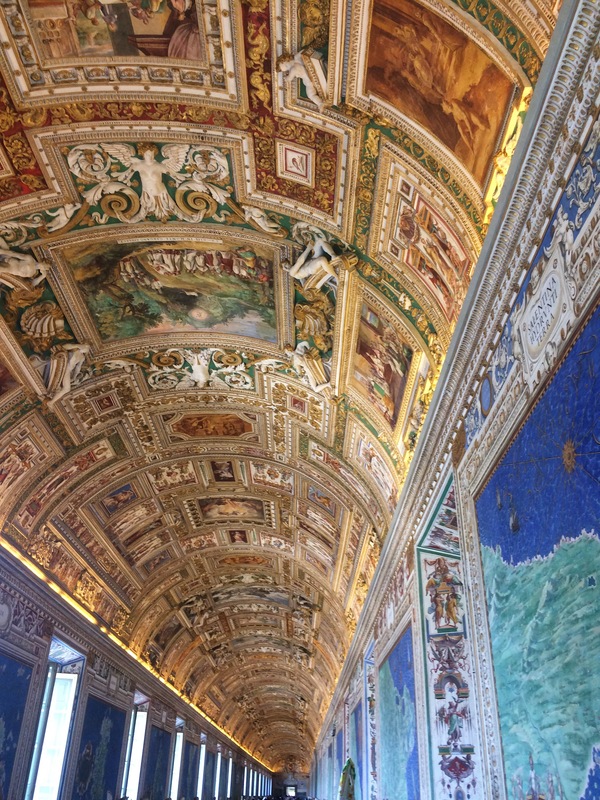 For a dreamy traveler like me, the bright blue and gold hall was my favorite part of the whole Vatican Museum. While in Rome we stayed with the Beehive Hostel, in one of their off-site apartments. Were I booking again, I would try to book inside the hostel instead of in the apartment which is about 10-15 minutes away from the hostel. We found it to be fairly reasonably priced and enjoyed being so near the train station. They also let us leave our luggage there before/after check-in/check-out time. Questions or thoughts about Rome? Feel free to leave a comment or read other posts about Italy. 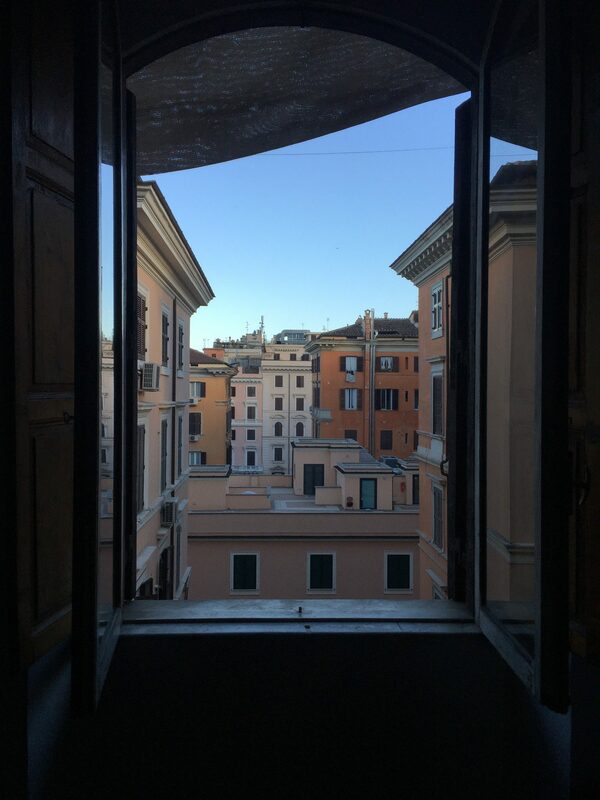 We did Rome in January with our toddler. It downpoured on our first day and by the time we got to our accommodation we were all in foul moods, were all really tired and although we needed food couldn’t be bothered with the trip out (hubby is gluten free so it’s not always easy to find somewhere). Thankfully we found a restaurant called Il Maggiolino and they were really on the whole gluten free thing which was great. The second day the sun was out and even though it was January it was a warm day. The second day was miles better too. 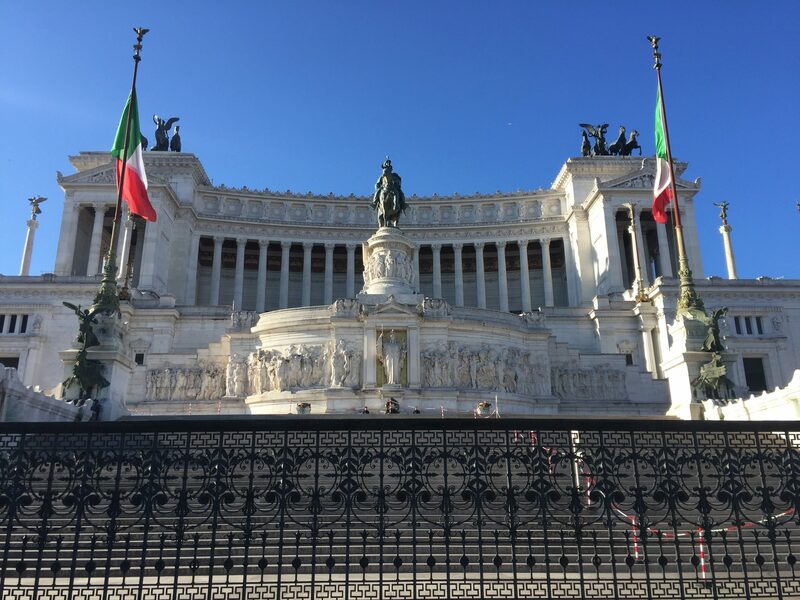 The big monument thingy (The Vittoriano Complex) has so many bits to it. Off the top of my head i remember there is a tomb to an unknown soldier amongst other bits. It is a bit of an eyesore to some people but it’s an amazing piece of architecture all the same. 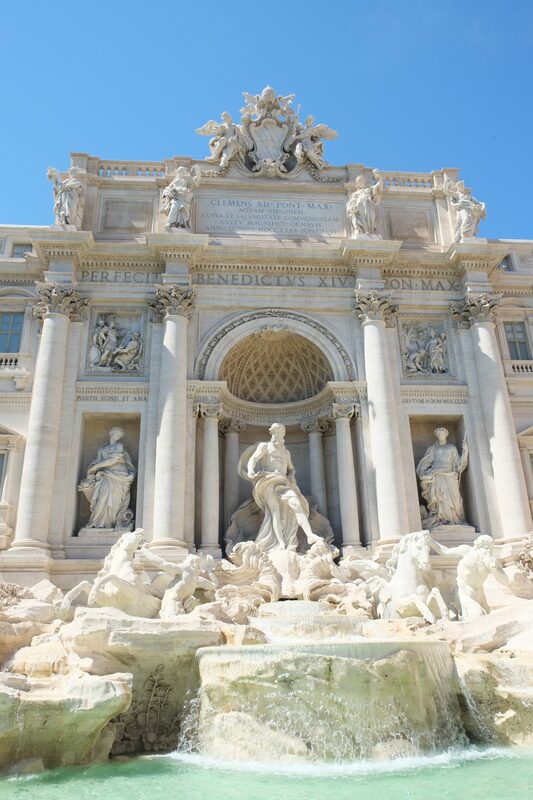 I loved the Trevi Fountain but struggled with the crowds around it. Oh, what wonderful memories you are making….and sister memories are the best! !